compasslearning.com/blended-learning/hybridge• Retail Prices: Hybridge single user license: 1-99 users $75; 100-199 $64; 200-999 $52; 1,000-5,999 $45; 6,000+ $38; A district-wide perpetual, unlimited license starts at $11,200. Annual subscriptions by site are also available. Pricing for all options vary. 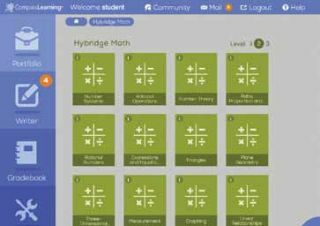 Hybridge is a new solution by Compass Learning that allows educators to create a blended instruction environment for K-8 ELA and math classrooms. Filled with guided instruction (via interactive video lessons) coupled with assessments, it lets teachers assign students units or individual lessons to learn or review. Individual student progress is tracked in the teacher dashboard and completely aligned to Common Core standards. Quality and Effectiveness: Teachers are able to search for and select lessons and activities in a variety of ways, including Common Core standards, textbook references, and the NWEA standard. Each lesson is designed to act as a supplement to what is happening in the classroom, not just as a replacement for regular instruction. As students work their way through instruction, teachers can emphasize formative assessment and re-teach content that students are struggling with. Teachers can use pre-created assessments, as well as build their own, by focusing on skills they wish to target. Ease of Use: Because Hybridge is an online solution, there is no software to install. The administrative help guides offer clear instructions for importing teacher and student information via a spreadsheet template. A Compass Learning onboard and technical specialist will work with district staff members to ensure that student and teacher accounts are created, automatic nightly updates are enabled, all technical and network configurations are performed, FastStart assignments are pre-populated with the program, and all details on where and how to find support are provided. Creative Use of Technology: Teachers are able to use Hybridge in three ways—as a supplement for instruction, as remedial help, or as enrichment. The ability to align to the most popular math and ELA textbooks means that teachers can easily create activities that align with what students are learning in the classroom. The guided instruction lessons are delivered to students in fun and engaging ways, increasing student attention and retention. The guided instruction can also be used for flipped instruction so teachers can focus more on application of skills during classroom time, while students receive the instruction in computer labs or at home. Suitability for Use in a School Environment: Because Hybridge is aligned to state and national standards, as well as to popular textbooks, teachers can easily and quickly create assessments and assignments as soon as they log in. This alignment makes it seamless to begin incorporating Hybridge into instruction. The guided instruction offered in Hybridge combines video, audio, and written text to help support multiple learning modalities, which further acts as a support or extension of what has been learned during teacher-led instruction. Students are also provided with access to toolkits, including math manipulatives, writing tools such as outlining and note-taking, as well as a portfolio to help them track their progress on lessons and assessments assigned by the teacher. • Data Driven Instruction: The Hybridge dashboard allows teachers to determine which students and skills need to be targeted to increase student achievement. • Differentiation: The ability to track students and create individualized pathways of instruction makes this a powerful tool for differentiation. • Alignment: Hybridge is fully aligned to the Common Core standards, as well as state-level standards and popular textbooks, which makes for seamless integration into the classroom. OVERALL RATING: Hybridge offers a blended learning solution that is easy to implement in the K-8 math or ELA curriculum.